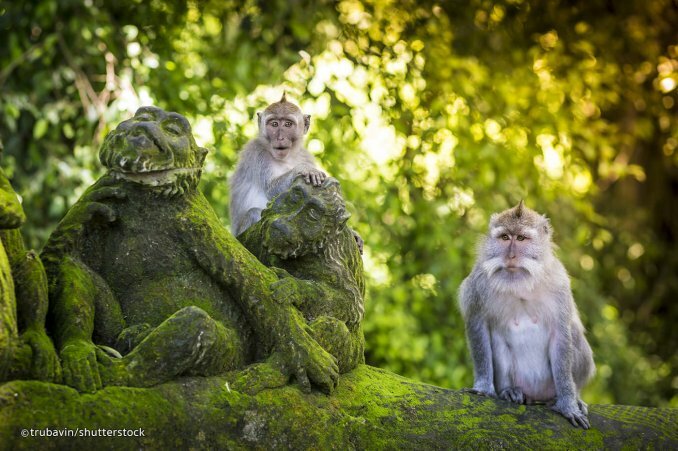 Ubud Monkey Forest, also known as the Sacred Monkey Forest of Padangtegal, is one of Ubud’s most popular attractions; a natural forest sanctuary that is home to a horde of grey long-tailed macaques. The site is well preserved thanks to a community-based management program. The forest is also conveniently positioned near Ubud Town Centre, and within easy walking distance from guesthouses and resorts along the main roads of Jalan Hanoman and the namesake Jalan Monkey Forest. Besides watching playful monkeys in their natural habitat, swinging through canopies, lazing along pathways or feeding on bananas, the site offers cool walks along paved pathways through a leafy nutmeg forest. Beautiful ancient temples with guardian statues covered in moss also feature throughout the forest. Those staying outside of Ubud and coming for a day tour usually have the Ubud Monkey Forest as a must-visit, combined with sightseeing highlights at the Ubud Royal Palace and shopping sprees through the expansive Ubud Art Market, all only a 10-minute drive away.